I know. It’s ridiculous. It’s crazy. I didn’t want to do it but they saw me first. Those beautiful little cans of ‘50’ in that still compelling, nostalgia-generating bright green and white 12-pack box with the red lettering. What are you talkin about, mister? I saw a twelve-pack of ‘50’ at our local, overpriced liquor shop. I go in. Go to the coolers. Top of the flow racks right to the left of what I was about to grab, there they are, a row coming down of 12-pack boxes of Labatt’s 50. “What’s this?,” I’m thinking. “It’s wrong. They don’t sell this here, not for years.” I would know. I’ve been guzzling bier in several decades. This can’t be Cinquante. Cinquante. That’s what Quebecers say, and when in Quebec do as Quebecers do. They appreciate that. “Deux Cinquantes, por favor.” I know. My French is execrable. 50. Something about 50. 50 years. 50 beers. It just flows. It’s all over now. All the 50 is gone and I can’t find it anywhere. I’ve no idea where the booze shop got it from and it was at an attractive price. It’s a shame. A tragedy. I can’t go on. I’ll go on. Absolutely. Last beer commercial you’ll ever see around here. You said that, Dudelette. “Cinquante, s’il vous plait!” I used to love doing that. In Hull, Chicoutimi, Montreal, Quebec City. Nostalgia. Once you figure out what it means it tastes pretty good. 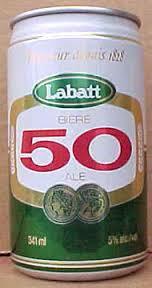 This entry was posted in Certainties and tagged Chicoutimi, Hull, Labatt 50, Montreal, Nostalgia, Quebec City. Bookmark the permalink.